While enjoying your stay in Creede, don’t miss browsing through the many unique Creede stores, shops and galleries that are on main street. You can begin your endeavor on the north end of town. 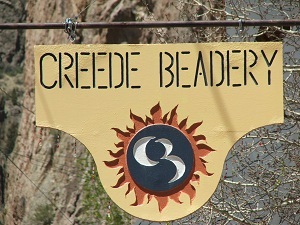 On the east side of the street is the Creede Beadery which stocks thousands of unique beads. A group I (Debbie) am involved in recently participated in a beading day where necklaces, bracelets, and earrings were made. Call the Beadery to reserve a time to do a beading project with your friends/family. You won’t be disappointed. 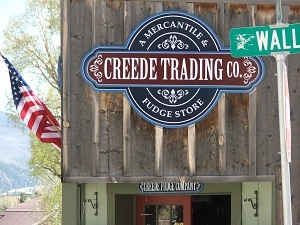 Down the street to the south you will find many fun Creede Stores. Make sure and stop at Café Ole and having a homemade pastry and a cup of gourmet coffee. If you have come to Creede to experience fly fishing, don’t miss the Rio Grande Angler located at 13 S. Main Street. They have an incredible selection of flies and all other accessories necessary to make your fly fishing experience a success. Another great Creede store is San Juan Sports located at 102 S. Main. They have been in Creede for 36 years and have many clothing items including hiking boots, beanies, and Columbia wear. All of your needs for a day of hiking including a canteen, fly repellant, maps, and advice, is at San Juan Sports. Further down the street is Rare Things which, as the name indicates, have very unique and unusual gifts including pottery, jewelry, antiques, woodwork, rocks, minerals, and decorative arts. If you need groceries or a cold drink, stop in at the Kentucky Belle Market. Don’t miss the Creede Trading Post. I bought one of their short brimmed hats and lotion loaded with all natural beeswax, cocoa butter, olive oil, coconut oil and sweet almond oil. A real treat for my husband’s dry hands! And don’t forget to buy some of their homemade fudge. The owners make it there in Creede and it is delicious!! As you are heading north make sure to stop at the Holy Moses and tell Vicki, the owner, I said hello! Vicki carries pottery, quilts, linens, specialty foods, and a wonderful collection of cabin décor. People from the Valley love to go to the Holy Moses and will drive an hour to see what new items Vicki has in stock. Don’t miss the store, Off Broadway. They have very unique jewelry and many items made in Africa. Some of the proceeds from the sale of the African items are returned to help the widows and orphans in Africa. Allow time to eat at one of the dining establishments such as the Creede Hotel, Old Miners’ Inn, Kip’s Bar and Grill or the Big 6 BBQ. Check out our complete list of Creede restaurants. 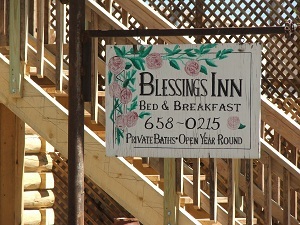 If you are spending the night in Creede, I suggest the Bed and Breakfast, Blessings Inn on Main Street. It is owned by a good friend of ours. Barb will take great care of you during you stay. As you can tell there are many great Creede Stores. Take a day to just enjoy the scenery and browse the shops.